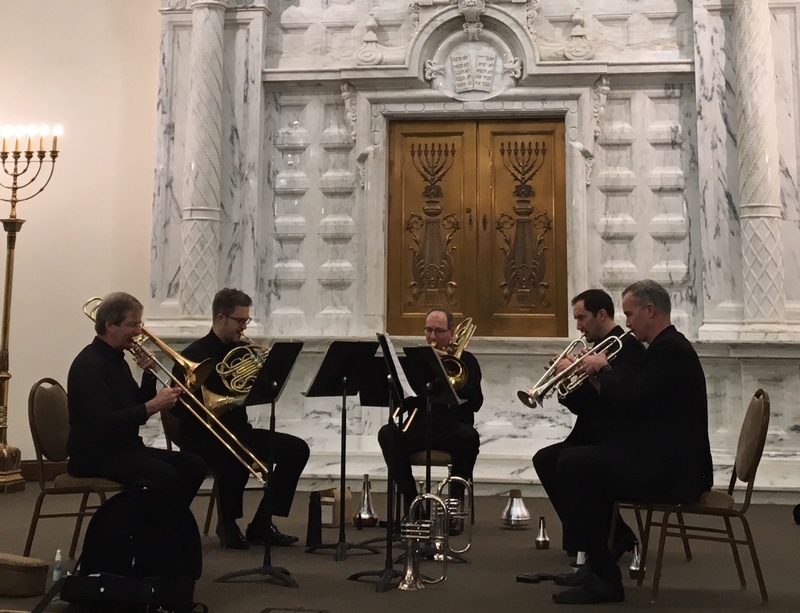 You could have spent last Sunday glued to the television and watching the Oscar hoopla – or you could have enjoyed some real talent at the American Brass Quintet concert. You could have paid homage to the little gold-plated statue at the Oscars – or you could have enjoyed some real, honest-to-goodness brass, learned something about canons (no, not the kind that fire cannon balls) and listened to music and poetry that go right to the heart. You could have. First there’s just the sound, the Temple-filling, soul-filling sound of five brass instruments. Think about this: can you imagine what honey or molten gold would sound like if they could sound? Well, that’s what these five instruments in concert sounded like. The tones and the harmonies blended and then flowed separately, then blended again. You would have heard centuries’ worth of songs, music that would have been familiar to Queen Elizabeth I or King James I; music that would have been heard in old St. Petersburg; music that celebrates the common man and the joy of the everyday in the 20th century. Can you imagine what honey or molten gold would sound like if they could sound? Well, that’s what these five instruments in concert sounded like. And there was a special treat: music composed around a breathtakingly poignant poem by Carmen Tafolla, San Antonio’s own poet laureate. The poem spoke ever so simply and ever so eloquently of the river, our river and, as recited by the author, it would have just broken your heart. The music, composed by James Balentine, was equally simple and eloquent. Performed as it was by this particular group, the music spun out the story of the poem in a universal language of pure beauty. By the way, it was also a world premiere of the work and was commissioned for San Antonio’s 300th birthday. Take that, Hollywood! And then the canons of the 16th century. Imagine the great castle halls and the cathedrals with this glorious music resounding in the vast spaces. Imagine the pleasure of following the musical lines through their twists and turns, counterpoints and harmonies, understanding the inherent structure where there seems to be none. How do they do that? I think it’s magic, pure and simple. Finally, the composition by American composer Eric Ewazen, a work dedicated to the American Brass Quintet on the occasion of their 30th anniversary, demonstrated the artistry and complete versatility of these five musicians. In three movements, the music went from languid to playful to joyous to sonorous. Pick your adverb; it was all of that and more. In three movements, the music went from languid to playful to joyous to sonorous. Pick your adverb; it was all of that and more. And don’t forget the last concert of this exceptional, sparkling season: the Orion String Quartet, a group that has become the standard of excellence in the world of chamber music, will perform April 15th at Laurel Heights United Methodist Church, 227 W. Woodlawn (corner Belknap). Buy Aunt Mattie a ladder and be there!